An editor with the conservative website Breitbart who was banned from Twitter in a row over racism has defended his right to speak at his former school. 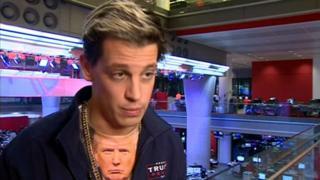 Milo Yiannopoulos has been invited to Simon Langton Grammar School for Boys in Canterbury, Kent, next week. The National Union of Teachers complained he was guilty of hate speech and should not be given a platform. Mr Yiannopoulos said people who are offended by his views do not have the right to prevent them being heard. His account was shut down by Twitter in July for comments directed at Ghostbusters' actress Leslie Jones. Breitbart News, which has been accused by some as being a hate site, is the most-read conservative news website in the US, and makes no secret of its close links to US President-elect Donald Trump. Writing on his Facebook page, Mr Yiannopoulos said: "I've been invited back to speak at my old high school, Simon Langton Grammar School for Boys, which once upon a time expelled me for absolutely outrageous behavior (sic). "The moral of the story is: success trumps everything!" Christine Dickinson, Kent secretary of the National Union of Teachers, said the invitation was of great concern. "Anybody that encourages racism, sexism, any other form of inequalities, and is against the British value of tolerance, then I am very worried about them having access to young people," she said. But Mr Yiannopoulos countered: "Just saying 'I'm offended' isn't an argument. "For too long you've been able to shut down opposing points of view and the politics of the people you don't like by saying 'I'm offended'. "Well, that period is over now and the Donald Trump presidency, representing as I think it does an existential threat to political correctness, is a wonderful thing." Image caption The school said it was "fully committed to free speech"
In a statement, Simon Langton Grammar School for Boys said it welcomed free speech and open debate. "He was invited by the Langton Liberal Arts Society to give a talk on politics, the alt-right and the recent US election," the statement said. "The Langton does not practise censorship... we trust that our students will be able to use their reason to assail bad arguments and applaud sound ones."